The Sedona Messy Bun Beanie is the perfect transitional bun beanie for Spring and Fall. The open stitch work will keep you cool, while the rib brim will keep your ears warm. I kept the stitch work easy with only two main stitches in the body of the hat and just alternated them. 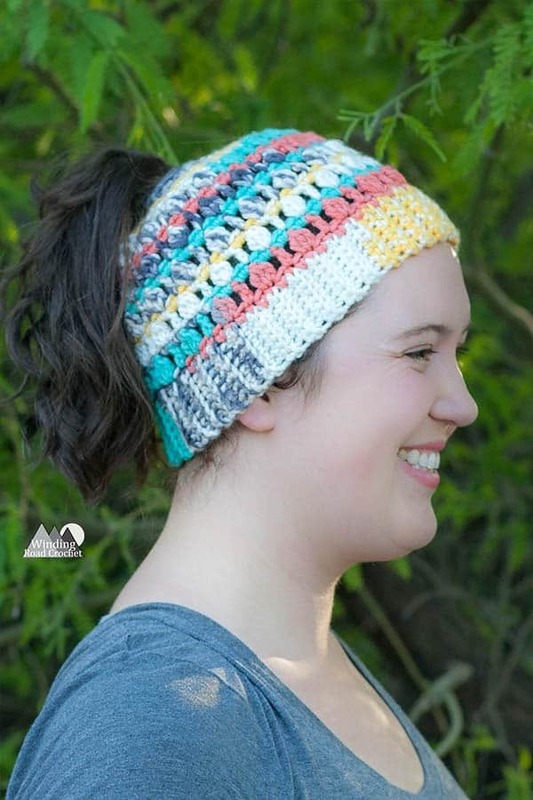 The Sedona Messy Bun Beanie is just a pattern that materialized out of thin air. I picked up a skein of Hobby Lobby’s I Love This Yarn in the color way Painted Canyon, started crocheting and by the end of the day I had this pretty little beanie. I have been in love with the Painted Canyon color way for a long while and have had two skeins sitting in my stash. Not only was I inspired to crochet this Bun Beanie, but I have a second project in the works with the yarn. Sign up for my newsletter so you don’t miss any of my new free patterns. I love messy buns because they are a great way to look good on a bad hair day. Just put on the beanie, pull your hair through and make a bun. If you are looking for more Bun Beanies check out my Chunky Plaid Bun Beanie. While you are here, check out my other Free Crochet Patterns. Here are some of my favorites! Cluster Stitch – *Yarn Over, Insert hook into the next Stitch, Yarn Over and Pull up a loop, Yarn Over and pull the first loop through the next two loops on the hook* Repeat from *to* a total of three times. You will now have four loops on the hook. Yarn over once more and pull the first loop through all the loops on the hook. Your Cluster Stitch is complete. This stitch will often be followed by a Chain to ‘close’ the stitch. Please be aware in Row 88 we will not be working a Chain after the cluster stitch. Hat Brim measures 19 inches around and the hat is 8.5 inches tall. Adjustments – You can adjust the brim of the hat by adding or subtracting 4 rows to the Hat Brim. To make the Hat shorter you can omit some of the rows between Rows 78-87 just make sure you work a row of Single Crochet before continuing to Row 88. Note: Leave enough of a starting tail to sew the ends of the brim together. Stop and sew the ends of the brim together. Do not fasten off. I did not turn at the end of the Hat Body rows. Note: In row 88 we are starting to Decrease and create the top of the hat by simple omitting the Ch1 Spaces. R93: Ch1, Sc in each St around. Slst to the first Sc. (13) Fasten off and Weave in your ends. Your Sedona Messy Bun Beanie is complete and you have a perfect hat for Fall and Spring. Are you going to make a Sedona Messy Bun Beanie? I would really like to see your finished piece, take a picture and share it with me on any social media! Just tag me @windingroadcrochet, #windingroadcrochet, or #ourcrochetjourney. Join my Facebook Group and share your creation with the community at Our Crochet Journey Facebook Group! Written pattern, tutorials, graphs and pdfs of the Sedona Messy Bun Beanie are copyright Windingroadcrochet.com. Please do not reprint or repost this content as your own, but please feel free to share this link with others. You can find more information on sharing my work with others in the Terms and Conditions Page.